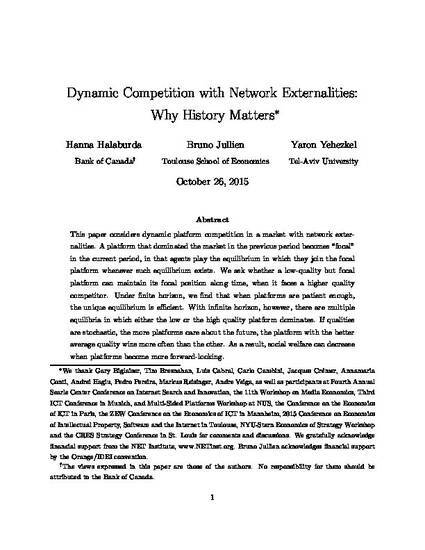 This paper considers dynamic platform competition in a market with network externalities. A platform that dominated the market in the previous period becomes ``focal" in the current period, in that agents play the equilibrium in which they join the focal platform whenever such equilibrium exists. We ask whether a low-quality but focal platform can maintain its focal position along time, when it faces a higher quality competitor. Under finite horizon, we find that when platforms are patient enough, the unique equilibrium is efficient. With infinite horizon, however, there are multiple equilibria in which either the low or the high quality platform dominates. If qualities are stochastic, the more platforms care about the future, the platform with the better average quality wins more often than the other. As a result, social welfare can decrease when platforms become more forward-looking.